With over 1100 analysts worldwide, IDC acts as a global provider for expertise on technology industry opportunities and trends. IDC’s analysis and insight is valuable to IT professionals, executives and investors aiming to make fact-based and data-driven decisions when it comes to technology. Taking a look back on some of last year’s predictions (advancements in cyber security protection, the growth of stand alone intelligent assistants in Canadian households, and revenue increase through data as a service offering – to name a few), it is clear that this foresight is factual. Resistance to change can be difficult to manage for many organizations. This has become evident for many Canadian businesses as our society becomes more digitized. Organizations are slow to create and implement digital monetization strategies, and they’re suffering because of it. Take a look at some major retailers – such as Claire’s, Toys R Us, Sears – all going out of business in 2018. A similar trend can be observed in media. As of 2018, one third of companies have no digital strategy. IDC predicts that by 2020, 20% of Canadian enterprises will struggle to remain viable as they fail to develop digital competencies and ignore strategic opportunities to monetize data. An example of this added revenue, tying into last year’s predictions, is offering data as a service. Digital leaders in Canadian enterprises stand out as they formulate a single digital roadmap for their enterprise, centrally led with a clear mission and formal accountability. Continuing on an upward trend with the growth of digitization is the criticality of developer skills in the workforce. These skills will be used to spur further innovation in Canadian enterprises rather than standard, low-stimulation coding. By 2021, over half the code in 50% of new apps will be from external sources while developer tool innovation will have improved visually guided functionality. However, the biggest hurdle for recruiting and maintaining top talent amongst companies is competition; this is particularly true for Canadian ISVs – 69% of whom rank it as their top growth challenge. This becomes more difficult with a skills gap, and by 2020, it’s expected that the Canadian IT skills gap will grow to 59,000 FTEs. We’ll see a growth in part-time developers, and a rise in low-code or no-code development tools. By 2021, IDC predicts that more than 50% of CIOs will deliver “agile connectivity” via APIs and services to enable growth in real time verticalized applications. Significant growth to any business requires leveraging and combining services readily available; this is particular true in DX economy. Canadian enterprises are catching on to this and promoting unions of services driven by LoB needs. Think food delivery services– they marry data from third party maps through APIs in order to give their consumer an accurate estimation of food delivery. Tow trucks within Toronto can leverage information pertaining to accident-ridden areas or traffic jams to understand where to best park their vehicles for most efficient service. The possibilities are endless. 70% of organizations today already do some custom app development – and quickly, requiring only 91 days to develop, test and release an app using PaaS. There’s an explosive growth expected in new apps on new architecture. 5G Will Generate New Infrastructure Spending, New Service Models, Specialized Devices… And Hype! Current infrastructure allows for a few thousand connections per cell tower; 5G is rated for a million connections per cell tower. The average reaction time for a driver is 0.7s. The latency for 5G is 1ms. This development will create a 90% reduction on the network side (benefitting carriers); batteries for IoT devices could last up to 10yrs in battery life. Due to these incredible advancements, from 2019 to 2021 IDC predicts that Canadian wireless carriers will invest billions in 5G to enable entirely new experiences and business models. Technological devices that will significantly benefit from 5G include factory robots, autonomous vehicles and rescue drones. In 2019, Process Automation Will Drive Artificial Intelligence Adoption: By 2020, at least 30% of Canadian enterprises will have adopted a form of “commodity” AI – non-deep learning AI that focuses on augmenting analytics with algorithms. Multi-Cloud Strategy Becomes Only Viable Enterprise Framework: By 2020, a “Best of Breed” approach is the #1 strategy among Canadian firms when using multiple cloud providers. Growth of IoT Endponts and Field Data Drives Interest in Edge Computing: 2019 will become the year of evangelism of edge computing with 10% of Canadian enterprises piloting new architectures, but mainstream edge computing won’t take off until 2021. Security and Privacy Claim Center Stage As Organizations Look to Shore Up Security Posture: By 2021 security services will surpass spending on security products. The Balance Between Convenience and Privacy Starting to Shift as Data Relevance Accelerates: By 2020, privacy and personal data ownership becomes a new revenue stream for consumer focused vendors. The Future of Work in Canada Will Incorporate Intelligent Automation and Digital Co-Workers: By 2024, 40% of structured repeatable tasks will be automated and 25% of workers in knowledge-intensive tasks will have AI-infused software or other digitally connected technology as a “co-worker”. Claire Dobbin is working as a product development engineer. She is heading towards achieving her formal certification with PMI and continuing project management work. 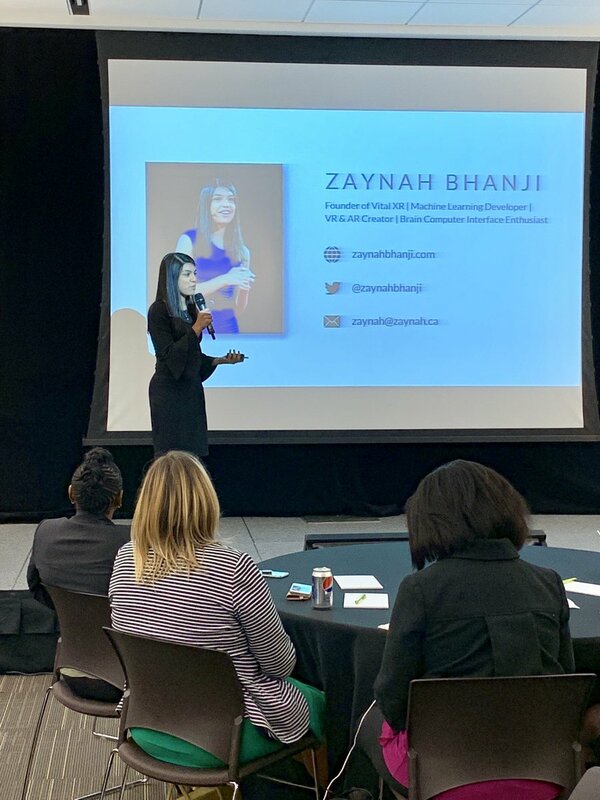 Through volunteer work for both the Toronto PMI and CIO associations, she intends to learn from the connected network around her and aims to help grow the PM community. Claire’s passionate about innovate products that can help others, and relishes in the opportunity to unite a team towards this success.